Year 2012 was average year for the investor in terms of gold, real estate & fix return investment. Equity has outperform but at the end of year. 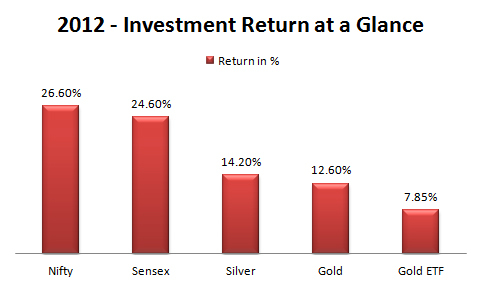 In 2012 Nifty has given 26.6% return while surprisingly silver is on second position with 14.2% return. Gold has disappointed many with return of 12% only. Apart from return if we talk about Investment option Year 2012 has provided lot of new investment option like tax free bonds, NCD and REGSS. We expect New Year 2013 will also bring lot of new investment option and ample amount of investment return opportunity to retail investors. Investment option selected by one investor may not fit with other investor’s requirement as it may be directly related to investor goal. As so many investment option are available in market investor may end up making mistake by selecting wrong investment option. It’s wiser to analyze investment option and then take a decision to ensure there is no dissatisfaction later. Here are few of such mistakes which should be avoided by investors in Year 2013. Many investors has done mistake this year in selecting right asset class. Most of investor has believed in history and invested in Gold which has given return consistent return of more than 20% from last 3 years. In 2011 gold has given return of 33% while equity was negative. Ultimately at the end of year Equity has turn out to be right asset class outperforming gold. So don’t see only historical performance while selecting right asset class. Many investors yet follow concept of fire and forget. They invest money and forget I must say that regular monitoring is necessary to identify any underperformance of asset class. Modification done within time can enhance return of your overall investment portfolio. This review can be done quarterly, half yearly or annually based on the goal of your investments. If you have not implemented it this year, then ensure your 2013 starts with making a periodic review calendar. While investing in Equities through mutual funds, most small investors make a mistake by selecting a sectoral or thematic fund as their first investment. Probably, they get attracted to the high returns it may have produce in the past but fail to understand the inherent risk. The creation of any investment portfolio should start with diversified funds or balanced kind of funds which have good downside protection along with ability to produce consistent returns. The risk in your portfolio keep on increasing as you add funds like mid-cap or sectoral funds.High risk investment options can be added but only when you have understood nitty-gritty of this investment. Low cost is viable but not the only criteria for investment. A low cost does not guarantee a fund performance and you cannot identify in advance which fund is going to be the best. There have been much reforms related to cost in either mutual funds, insurance or pension products like NPS in 2012. In 2013 you will be presented with more low cost options. Choose yours but do not rest your decision only on it and monitor the performance of the fund too. Please understand that backbone of misselling is free advice. As this advice is free but ultimately linked with commission associated with product. There are many financial planners now-Individually or Firms, who do charge for their services but keep their client interest on priority. Their focus is not on one aspect but a complete roadmap for their client’s future. So don’t act on free advice. Consult professional fee based advisor this year. With so much changes happening in personal finance worldwide, you cannot miss making “Money Management” a part of your new year resolutions. 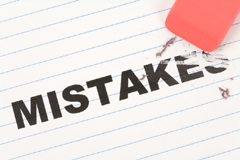 Ensure you learn and avoid repeating same investment mistakes in 2013. New Year celebrations are on. Have Happy and Wealthy 2013. May your all financial wish come true in 2013.